GN Solids Control is a leading manufacturer of solids control equipment and systems. The company started its first business in 2007, and our main goal has always been quality and reliability, which helps our customers save money and variable time. Of the total equipment we offer, three main products have proven to be stronger, durable and reliable: mud shakers, decanter centrifuges and cutting dryers. Solid control is very critical during the oil and gas drilling process, it will maintain the required property of the drilling mud and remove the low gravity solids from the liquid, and finally can make the drilling mud which could be reused and recycled in the drilling mud system. A good solid control process could increase the rate of penetration, reduce the wear and tear of the drilling equipment, such as the pistons, liners of the mud pump and allow for better hole cleaning. Centrifugal pumps are known to have high efficiency and low power consumption. This combination is critical in commercial buildings, for example, many centrifugal pumps can be used. Known for its durability and low maintenance due to its simple design Centrifugal pumps are used in buildings to pump general water supplies as boosters and household water supplies. The centrifugal pump is designed to pump sewage and mud. They are also used in fire protection systems as well as heating and cooling applications. In addition, they are very popular in the beverage, dairy, food and light chemical industries. 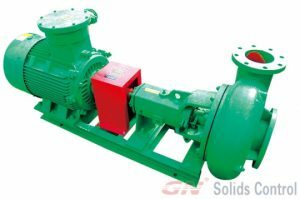 GNSB series centrifugal pumps are used to transport mud or mud or water. It can be used as a desander, a feed pump for desilters, or as a mixing pump for Jet Mud mixers. It can also be used as a stroke pump as well as a booster pump for drilling mud pumps. All GN centrifugal pumps are machined with tungsten carbide mechanical seals and well-known brand bearings. And spare parts are interchangeable with most international brand pumps to help customers easily access spare parts. The open impeller design reduces axial thrust loads and makes installation, maintenance and maintenance easier.